First impressions count in your business, and when it comes to creating a first impression, your reception area is the crucial element that you need to focus on. After all, not only is the first port of call when a customer comes in, but it is also a place that they are likely to stay sat in for a length of time. But what does your reception say about your business and why is this important? Your brand is vital to the success of your business, and you can use this space to reflect your colour scheme, visuals and an overall impression of the culture of your business of a whole. A business that takes pride in their appearance is likely to be one that cares about the service they provide. Therefore, you should always make sure that your reception area is well decorated, neat and tidy! 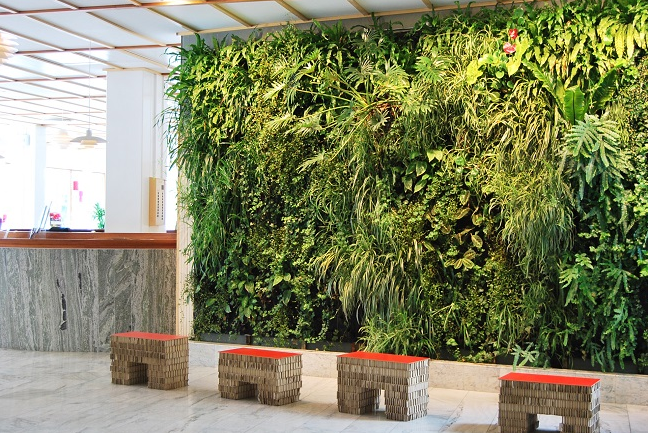 A living wall by Aztec is the solution! Your reception area is not only the place that your customers will spend time, but your staff will come through there too. If you have a bright, cheerful and well decorated reception then your employees will feel better about come to work. They are more likely to work productively and efficiently, which is great for you as a business. Many of us care about the environment, which means that we look for ways to ensure that our customers know we are a business who is eco aware. Flowers and plants in your reception area are definitely a way to go, as these show that you know how to make the most of your reception area, and that you also care about the environment! All things that are likely to make sure that your customers come to you over your competitors! Aztec Plants can advise what will work best in your facility. Making an impression in your reception area is reinforced by brightly coloured blooms. Flowers are a cost effective and impactful to make sure that your reception area looks great, and they are also a lovely addition to have. If you want something that is a little different, then why not install a living wall instead?